Staying healthy is important to our overall well being and happiness. Everyone knows this, but cycling health is a matter of staying healthy and injury free so that continuous fitness gains can be made and basically, you can just do more of what you love! Ride that is! Fortunately, with some simple, routine actions, it’s easy to remain healthy and injury free. Bike fit: In a sport based on such a highly repetitive action, like pedaling, the first line of defense against injury is a proper bike fit. Whether you’re just starting to ride or you’ve been cycling for a long time, consider the benefits of a professional bike fit. Fit impacts comfort but also technique which is crucial to preventing overuse injuries. If you aren’t sure what to look for, you may want to notice any bike parts that need to be replaced. Saddle injuries are the result of poor seat position, height, angle or design. While your saddle may look and feel fine, looks can be deceiving. Materials and composition deteriorate beyond what is visible. Also, neck, shoulder, and bike pain can result of an improper fitting bike. Handlebars, stems, and bike position all contribute to a rider’s stability, endurance, and safety. Bike Inspection: Just because your bike may not be making noises or shifting poorly doesn’t mean it doesn’t need some TLC. Noises are obvious signals for inspection yet, regular bike maintenance is a necessity. As you ride more through the summer season, some things that weren’t visible upon your first bike inspection earlier in the year may become apparent as the season progresses. Regular maintenance is essential. There are several things you want to do to keep it in good working order. For starters, wipe down and inspect the frame. Remember to lube your chain and cables. As unglamorous as chain lube is, it is a necessity. It will keep your bike parts in working order and squeak free! There are many lubes to choose – wet vs dry lube. As conditions vary, you may want to have a couple of different choices on hand. Finally, inspect your brake pads. You’ll want to make sure the brake pads are not worn. And, remember to inspect where the brake pads hit the rim; they should contact the rim evenly on both sides and not rub the tire in any way that may cause a flat. Wheel Inspection: Obvious inspections includes tires, rims, and spokes. Check that there is adequate air pressure in the tires. Check that there aren’t any cuts or nicks in the sidewall or tread of the tires. But maybe you’re considering a new wheel set? Or perhaps going tubeless on your mountain bike. Sometimes making changes to your current setup can inspire motivation to get out there and ride. Check out our video on Wheelset Buyer Guide for What You Need to Know. Whether you are thinking about road bike wheel sets, mountain bike wheel sets or just getting some thoughts together on wheel buying parameters and how your wheel set will affect your overall ride and other bicycle parts, this video will guide your way. Biofeedback: Remember, it’s not all about the bike! Be mindful of bio feedback. What is your body telling you? Have you recovered from your last training ride or training block? Do you need rest? Or, are you ready to get out there and put some major miles and efforts in? If you’re not sure of the messages your body is telling you, read our post, Overtraining? How Nutrition and Sleep Play a Role in Recovery for insights as to the stages of training and what to do about them for best performance. Fortunately, due to the advancement of technology, there are countless apps available to help dial in bio feedback measurements and evaluations on the fly. In a nutshell, if you take care of your bike and yourself, then you will remain healthy and injury free. Sounds simple, and it is, but you have to remember to do it. Safe pedals friends! Still searching for the perfect holiday gift for your favorite cyclist? Well, if you’re anything like us at Peak Cycles Bicycle Shop, health and fitness are gifts that you want to share with your family and friends all year round. So why not select gifts that will help your favorite cyclist to be really motivated to continue reaching health and fitness goals in the New Year? Your search for the perfect holiday gifts are over! Surprise and delight your favorite cyclists with our list of healthy holiday gifts! Nutrition matters. We all know it – but that doesn’t mean we eat and drink what we know we should. And athletes suffer from poor choices too. The symptoms of poor nutrition rears its ugly head in many ways: via muscle cramping, struggling to complete workouts, and unsuccessful race efforts. Eliminate all the frustration and gift your favorite cyclist with bike nutrition. We have several options including nutritional products just for women. Specifically, Osmo nutrition – This product is specific to women offering three options: active hydration, acute recovery, and preload hydration. Other favorites for both men and women are Scratch Labs and Honey Stinger Products. Medical compression stockings have been used to treat poor blood flow for many years. Recently, the technology has been made available to cyclist of all levels. While the many claim it is difficult to prove that an immediate performance gain from wearing compression garments, many do claim that it lowers perceived muscle soreness the day after a big day on the bike and they can reduce the swelling of legs after prolonged sitting. Is your cyclist a data junkie? Then, this is the ideal gift for your favorite cyclist! The main idea behind using cycling training tools is to dial in training to optimize performance as it relates to specific goals and objectives. Our post, The Best Training Aids to Launch into Spring Cycling, dives into the benefits of training with power. As for which power meter to purchase, consider our most popular one, Stages Power Meters, beginning at $1000. Stages Power meter is the lightest, smallest, most technologically advanced unit available today. Another option is the Pioneer Power Meter offered at $2000 and is a bit more sophisticated. A third option is a company that’s been around for a while now – PowerTap Power Meter. Gift a Bike fit – Does your cyclist complain of hands falling asleep while riding? Or shoulder or neck pain after a long ride? A bike fit isn’t just for professional riders – they are for anyone who rides whether they are a beginner or advanced rider. A bike fit helps ensure riding comfort but it also impacts technique which is crucial to preventing overuse injuries and how an athlete rides. Consider the gift of giving your favorite cyclist a bike fit for Christmas. Not only can we help them with the fit, but we carry all the bike parts required to get the bike in the very best setup for their riding needs. Give us a call (303) 216-1616 or stop by the shop in Golden to schedule your bike fit. Gift a fat bike demo! That’s right! Fat bikes are all the rage. They thrive in snow, sand, desert, bogs and mud as well as riding what is considered normal mountain biking. 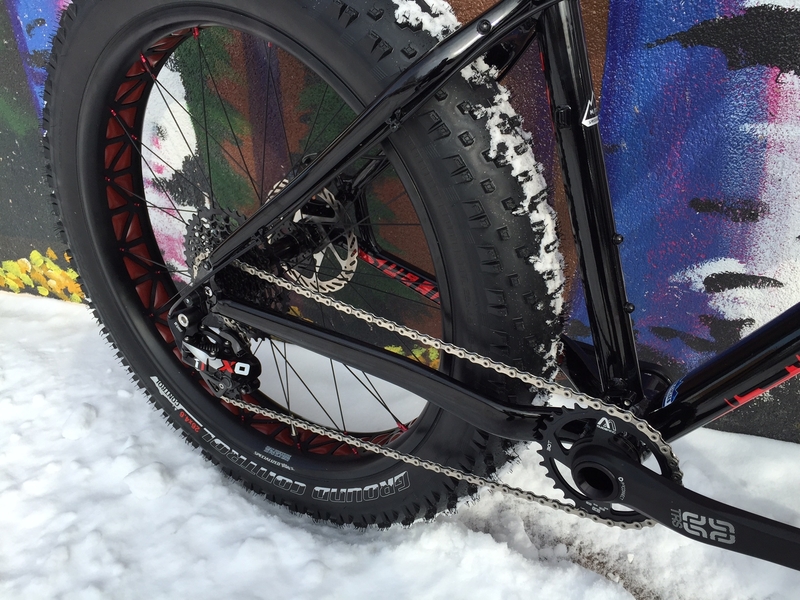 In fact, fat bikes are the fastest growing segment in the bike industry. Book a fat bike demo for your favorite cyclist that will up the giggle factor to their normal winter riding program. Who can’t smile while riding a fat bike? And last but not least, what is a cyclist dream gift? Bike parts! As a reminder, our shop BikeParts.com offers a huge selection of road bike parts, mountain bike parts, BMX bike parts and more. If you need it for your bike, then we have it! Because we sell our bicycle parts online, we are able to help customers all over the world. In addition to bike parts, we also carry a large selection of bicycle accessories. We know bikes, and our extensive inventory includes more than 45,000 bike parts from all of the leading manufacturers including Avid, Pearl Izumi, Shimano, Rock Shox, Michelin and SRAM. There you have it! See how easy it is to make your favorite cyclist smile this Christmas? By selecting a healthy cycling gift, you help your favorite cyclist reach health and fitness goals well into the New Year. Happy Holidays and Happy Riding! Winter is coming in most parts of the country. But even though it is winter does not mean that you have to give up riding your bike. While the off season may be underway, this is the perfect time of year for commuters and athletes to start bike maintenance preparation for the winter months. Winter riding poses many threats so having a bike in good working order keeps you safe, warmer, and provides the opportunity for a more enjoyable ride. Besides, a good ride always does the body and mind good! The trick to making winter riding work for you is to winterize your bike. When prepping your bike for for the winter, there are several things you want to do to keep it in good working order for the winter months. Invest in fenders! You’ll love them because the fight off salt, sand, and ­oil-laden road spray. By installing full fenders, you will keep crud off clothing and grit from getting into—and wearing out—most components. And you! Keep the rubber side down! Slick surfaces and crashes are fun – said no one- ever! Do yourself a favor and invest in new tires. New tires will be easier to control on icy roads and slushy trails. We have a huge selection of mountain bike and road bike tires online at BikeParts.com and also in our Peak Cycles Bicycle Shop. Stop by to hand select the best tires for you. Wipe your bike down. Combat corrosion and griminess due to salt and dirt by wiping down your frame after each ride. This is especially important for wet bikes. Rain, snow, ice, and road elements pose different cleaning challenges to your frame and bicycle parts. Consider using a stiff, soft-bristled brush to knock off any chunks of dried-on mud that may be on your frame or wheels. Then, follow that up by taking a rag to your bike, wiping it down generally all over to get off any remaining dust or dirt. You’ll want to make a point to clean your bike chain weekly. Safety First! Be seen and be safe. Winter riding involves riding in grey days! Of course, visibility is critical. Outfit your bike with a good light system. You will want lights for the front of your bike. Consider having multiple lights for the front of your bike. One on your helmet so you can shine side roads and traffic and have a second light on your handlebars so you can see at least 10 ft. or more in front of you. For the rear of your bike, opt for a rear red light- particularly one that blinks. A blinking red light is much more likely to get the attention of a passing motorist who might otherwise not notice you. You may also consider purchasing cycling apparel that is visible. There are options to choose from including vests and ankle bands. Also, reflective tape is a good idea. 3M makes black reflective tape that is great to put on black wheels. You do not notice it during the day and it shows up white at night. Avoid a wardrobe malfunction! As the temperature drops, it’s hard to know what to wear when it’s 50 degrees and sunny outside versus 30 – 35 degrees and cloudy. Riding in transitional weather can be a challenge! But, with clothing that is versatile, lightweight, and easy to pack down, you can find a cycling wardrobe that works for you. Check out our post, Avoid a Clothing Crisis! New Threads to Keep you Warm for Fall and Winter Cycling for great winter riding clothing options. Have no fear of losing cycling motivation in the winter months! The first step towards successfully riding through the winter months is winter proofing your bike. When you are confident in your bike and clothing options, there are less excuses to tell yourself for not riding and more reasons to get on the bike and enjoy the ride.